UBReUSE is a student-run move-out program that recovers useable objects that usually get thrown out or left behind by students leaving for the summer. A group of students at the University at Buffalo came together to tackle the problem of material waste created during student move-out from the dorms at the end of the spring semester. We noticed that usable goods like school supplies, furniture, food and books were ending up in trashcans and dumpsters only to be taken to a landfill. In partnership with the Post-Landfill Action Network, we seized the opportunity to save these goods and give them a new life. Our student led team created the UBReUSE pilot program in order to save usable goods from ending up in a landfill. Our team facilitated collections around the dormitories at the University at Buffalo during student move-out and cleaned and sorted the items over the summer. With these items, we planned to hold a campus wide yard sale at the start of the fall semester. With this program we, saved useable items from going to landfill as well as provided students with an alternative to buying new items at the beginning of the next year, reducing overconsumption. Students create a lot of waste during move-out season. Our student-led team designed this program to divert usable items, like school supplies and furniture, from ending up in a landfill. The first step was to organize collections around dormitories on campus and dumpster dive to save as many items as possible. After the collections were complete, we secured a storage unit in partnership with the UB Office of Sustainability and UB Facilities department in order to store the saved items over the summer. Over the summer, items were cleaned and refurbished to get them ready for the big move-in sale for the upcoming fall semester. 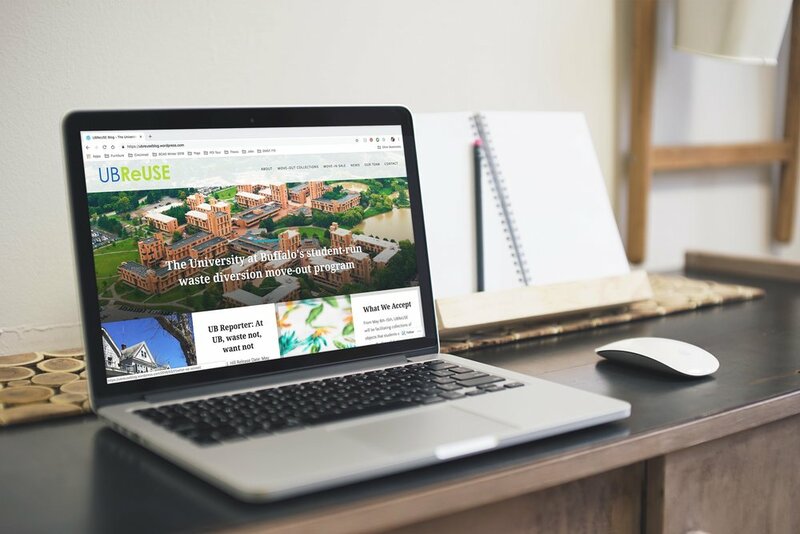 At the beginning of the fall semester, the items that UBReUSE saved from going to landfill were sold back to incoming students in order to create a Green Fund for other student-led sustainability initiatives on campus. My role as Marketing Coordinator was to create and maintain UBReUSE branding and outreach during our first prototype of the program. This included creating a Wordpress blog to share collection information, maintaining our social media accounts and designing all of the print collateral for our programming and events.